FREDERICK, MD-The Carolina League announced on Tuesday that Michael Baumann has been named the circuit's "Pitcher of the Week" for August 27-September 3. He becomes the third Keys player to garner a weekly honor this season and the only Frederick pitcher to claim a league award in 2018. Previously, Wilson Garcia was named Carolina League Player of the Week for May 14-20 and Ryan McKenna earned CL POW accolades for May 28-June 3 and June 11-17. Starting for the Keys on August 30 in the club's road finale at Potomac, Baumann, 22, tossed seven shutout innings of two-hit baseball in his last outing of the year. He walked one and struck out five while retiring the last 11 batters that he faced. A 3-0 Keys win over the Nationals, Baumann and Keys closer, Tyler Erwin , combined to set down the last 17 Nationals hitters. The win for the right-hander snapped a three-start losing streak and allowed Baumann to finish 8-5 with a 3.88 ERA in 17 starts with the Keys. Logging 92.2 innings, he allowed 42 runs (40 earned) on 82 hits to go with 40 walks and 59 strikeouts. Opponents batted .238 against Baumann. Promoted to Frederick on May 18, the former Jacksonville product started the year with Low-A Delmarva. Between the two classifications, Baumann put together one of the best seasons by an Orioles minor leaguer in 2018. In 24 starts, he went 13-5 with a 3.17 ERA. Over 130.2 innings, he gave up 49 runs (46 earned) on 105 hits. The right-hander walked 53 and struck out 106. 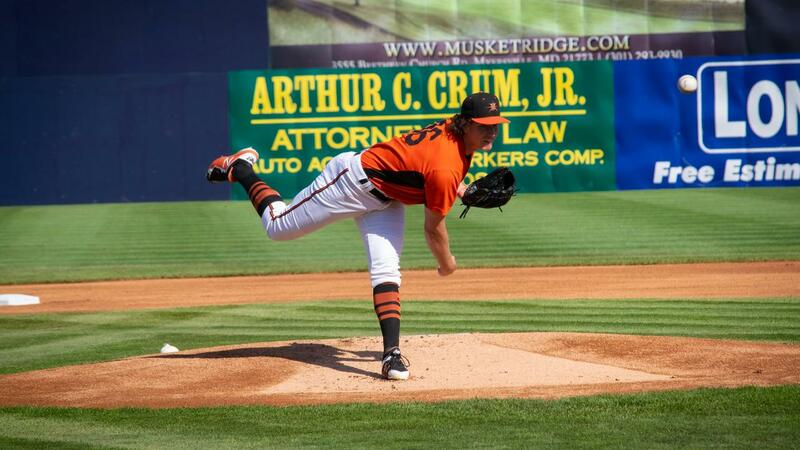 Among Orioles minor leaguers, Baumann placed second in wins (13) and fourth in ERA (3.17). Selected by the Orioles in the third round of the 2017 draft out of the University of Jacksonville, Baumann went 5-3 with a 3.09 ERA during his junior season, while he was the Atlantic Sun Pitcher of the Year and the Atlantic Sun Freshman of the Year in 2015. At Jacksonville, Baumann was teammates with former Keys outfielder, Austin Hays .